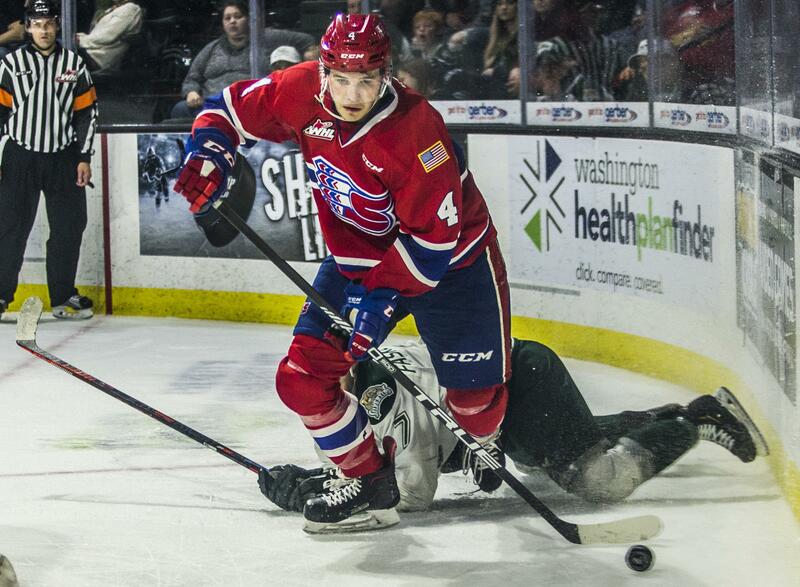 EVERETT – Ethan McIndoe scored two goals and added an assist, and the Spokane Chiefs used a four-goal third period to pull away and defeat the Everett Silvertips 6-3 in Game 1 of the second round of the Western Hockey League playoffs. McIndoe opened the scoring 2 minutes, 1 second into the first period when he chipped a shot over Silvertips goalie Dustin Wolf. Everett twice tied the game before Luke Toporowski fired in a shot 39 seconds into the third to make it 3-2. Riley Woods added the eventual winner midway through the third on the Chiefs’ only power play. Spokane is 7 for 12 on the power play in the playoffs. McIndoe added an insurance goal on a wraparound before Luc Smith scored on an empty net. Woods has a point in all six of Spokane’s playoff games. Toporowski has scored in four straight. Eli Zummack added a goal and two assists for the Chiefs. Bailey Brkin made 29 saves. Jackson Berezowski scored twice for Everett. Published: April 6, 2019, 10:19 p.m. Updated: April 6, 2019, 10:31 p.m.